"My husband was the inspiration for this recipe. These rolls are extremely tasty and are not heavy. The secret to this recipe lies in the frosting. As they say the easiest way to a man's heart is through his stomach!" Deflate dough and turn it out onto a well floured surface. Roll dough out into a rectangle and spread with butter. Sprinkle with cinnamon and sugar. Roll up dough and cut into 3/4 inch thick rolls. Place rolls in two lightly greased 9x13 inch baking pans. Cover and let rise until doubled, about 45 minutes. Bake rolls in preheated oven for 15 to 20 minutes. While rolls are baking, prepare the frosting. In a medium bowl, stir together confectioners' sugar, 1/3 cup butter, vanilla and milk. 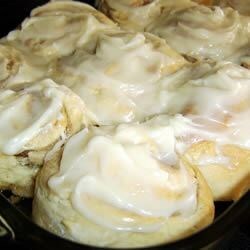 Let rolls cool slightly then spread with frosting. The prep time was incorrect. Sorry for the misprint. Very good. Tastes almost as good at the amish cinnamon rolls that are popular here.